FORECASTERS PREDICT THE coldest Super Bowl and a chance of rain or even snow at next Sunday’s National Football League title showdown, but players say they don’t fear sub-freezing conditions. The Denver Broncos and Seattle Seahawks arrived Sunday in suburban New York for Super Bowl 48, what will be the first outdoor cold-weather clash in the NFL Super Bowl era that began in 1967. “We’re not really concerned,” said Denver safety David Bruton. “We have played numerous cold games. The coldest Super Bowl was played in 39 degrees Fahrenheit (four degrees Celsius) at New Orleans in 1972, but next Sunday’s high is only set to reach 37 and is likelier to be near the projected low of 27 for the night-time kickoff, with a 30 percent chance of rain or snow. “It would be fun to play in some snow,” said Seattle cornerback Richard Sherman. Super Bowls have been typically staged in palm-tree climates such as Miami or San Diego, or in domed stadiums when northern cities such as Indianapolis, Minneapolis or Detroit have hosted. “You can’t let the weather play a part in executing the game plan,” Bruton said. “We’re just going to have to go out there and execute no matter how cold it is. The Seahawks have tried to stress they will do the same things that put them in the Super Bowl no matter the distractions. 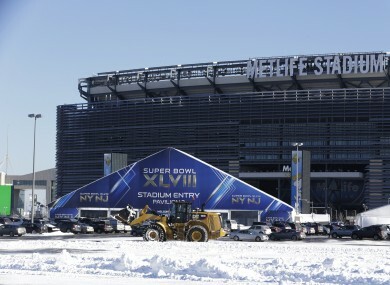 NFL team owners voted in 2010 to have the game played in New York, with one notion being that a successful Big Apple appearance could open doors for future cold weather Super Bowls. Rocky Mountain chills are common for the Broncos in the winter months. Broncos quarterback Peyton Manning is confident because the team has played and worked out in the cold for weeks, even though wind and snow could play havoc with Denver’s record-setting precision passing attack. NFL championship games were often played in cold weather before the Super Bowl era and some epic moments ensued. A frozen field for the 1934 title game in New York prompted the host Giants to don sneakers instead of cleats in the final minutes and they rallied with 27 points to beat Chicago. A blizzard hit the 1948 final at Philadelphia, when the host Eagles beat the then-Chicago Cardinals 7-0. To reach Super Bowl 2, the Green Bay Packers beat visiting Dallas in a 1967 game known as the “Ice Bowl” for being played in minus 13 F (-25 C) on the frozen tundra of Lambeau Field. For some, the chance to win a Super Bowl matters more than the temperature. Denver cornerback Champ Bailey has played 15 seasons to reach his first Super Bowl. He’s ready for the chill. Email “Sunday's Super Bowl could be the coldest in history”. Feedback on “Sunday's Super Bowl could be the coldest in history”.